We currently have a waitlist for participation in our Zoo Club. Groups of 15-30 students can sign up for an EDventures at the Zoo program. These programs are 30 – 45 minutes in length and themed to the specific habitat we meet. Each program is $60 and up to three programs can be scheduled a day. To learn more about specific themes, visit our EDventures at the Zoo Offerings Page. The Zoo can also come to you! If your group meets within 100 miles from the Zoo, an educator can come present one of our Zoo to You programs. These are for 15 – 30 students and are about an hour in length. Each program is $75 and for locations over 25 miles away, there is a $0.50 per mile fee. To learn more about the themes we offer, visit our Zoo to You Offerings Page. Registration for the 2019-2020 school year will be June 1, 2018 – July 31, 2019. Current zoo clubs will be able to register starting May 1, 2019. At this time, there is a wait list to join the program as only ten are accepted each year. Please contact the North Carolina Zoo Education School Programs Office 336.879.7718 toll free 1.800.488.0444 x 7718, or email during for more information. Home School groups may become a part of Zoo Club by registering a group of at least 30 students. 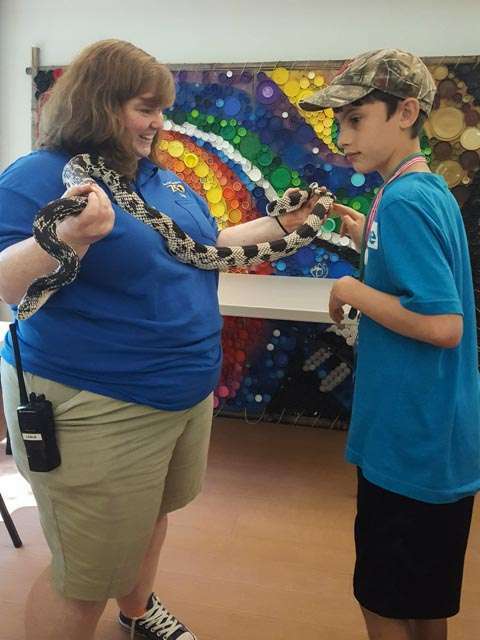 Programs are tailored for K-8 grades so Pre K and 9-12 graders are not able to partake in this opportunity, but can look into EDventures @ the Zoo programming on the School’s webpage. A coordinator of the group will be responsible for securing an offsite location and getting together all the necessary information for registration. Membership fees for 2019-2020 Zoo Club are $20 per child. These fees will cover the cost of all program components for the current school year (September - May). Individual fees are to be collected by the group coordinator and one check for the whole club sent in no later than August 31st, 2019. This program can travel to groups located up to 100 miles from the Zoo. For locations outside a 25-mile radius, a onetime additional charge of $.50 per mile, round trip will be added. If you have any questions, please contact the North Carolina Zoo School Programs Office 336.879.7718; toll free 1.800.488.0444, ext. 7718, or email. Living with Nature is our free distance learning event series. Annual fall contest for K-12 graders where art and conservation collide. Looking for a educational experience for your students at the Zoo? These programs have differing themes depending on group size. Educational Programs for classrooms or assemblies that are brought to your location within 100 mile radius of the zoo.